This is not a dream; Parma really did win at San Siro. Absolute ecstasy; that night in Madrid was a crowning achievement of many, many careers. Wesley Sneijder moves to Inter from Real Madrid for £13.5m. The last piece of Nerazzurri puzzle lands where it’s supposed to be. Strikers Eto’o and Milito, alongside with centre-back Lúcio are also in just a couple weeks earlier, teaming up in a starting XI with seven hardened veterans. Cristian Chivu’s been there for two years. Maicon – for three. Samuel – four. Júlio César and Cambiasso – five. Dejan Stanković – six. Legendary captain Javier Zanetti – for incredible fourteen years. The stage has been set. Inter win their fifth consecutive Scudetto. After a nearly decisive loss against Roma in March, José Mourinho’s players achieve the impossible and pick up 19 points from their final seven matches to keep a two-point edge over the rivals from the capital. Diego Milito misses a handful of chances only to score from Javier Zanetti’s mazy run and hand his club a 1-0 victory. The Special One celebrates the success by blowing a kiss to a TV camera and immediately walking back to a dressing room. Nerazzurri lift the Champions League, becoming the best European club for the first time in 45 years. At Santiago Bernabéu, Milito is the executioner again, scoring from a one-two with Wesley Sneijder and then bamboozling Daniel van Buyten to secure himself a brace. Him, Cambiasso, Zanetti, Lucio, Maicon and Julio Cesar form the South American contingent pivotal to the greatest success in the club’s history: the treble. Through the whole season, the team loses only seven out of their 57 competitive matches. Unbelievable. Abu Dhabi, United Arab Emirates. Goran Pandev pounces on a through ball from Samuel Eto’o to open the scoreline. Two minutes later, Eto’s finds space in the box himself and finishes low to double the lead. Substitutes Dejan Stanković and Jonathan Biabany conclude the match with a move that leads to the third goal. The crazy era of Internazionale’s dominance ends in a shower of golden confetti, with Javier Zanetti passing around the slim trophy for the best football club on the planet. Mourinho’s replacement, Rafael Benítez, is gone. After winning only 3 out of his last eleven league matches, the Spanish boss leaves Inter in fifth place, 13 points behind AC Milan. That massive gap is later reduced to six points by Leonardo, but Inter still finish the league campaign below their local rivals, doing so for the first time since the Calciopoli scandal in 2006. A particularly bitter pill to swallow are two league defeats to Rossoneri – each suffered without a single goal scored past Christian Abbiati. A shock at San Siro. Despite opening the scoreline through Dejan Stanković’s long-ranger, the hosts fall 2-5 to Schalke after a game marked by so many errors and missed chances that it could’ve seen a cricket score. Christian Chivu is sent off for two yellows, Andrea Ranocchia scores an own goal and the German team takes home an insurmountable aggregate lead. “Who could have imagined it would turn out like that? A crushing defeat. Schalke had seven shots on target and scored five goals.” – Leonardo concluded. GOAL: Inter 2-5 Schalke – We can't believe what we're seeing. Schalke hit the post, Inter fail to clear and Edu slams home a fifth! It’s been a long time since things were this bad for Massimo Moratti’s club. Having lost four matches in a row, including home embarrassments against Novara and Bologna, Nerazzurri barely rescue a point in a 2-2 draw against Vincenzo Montella’s Catania. Three weeks later, manager Claudio Ranieri loses his job. Two years after winning every competition possible, Inter finish 26 points off Juventus, 22 points off AC Milan and eliminated by Marseille in the Champions League’s Round of 16. Inter, now without Júlio César, Lúcio, Maicon and Sneijder, score a huge, 3-1 win over Juventus in Turin. This is Andrea Stramaccioni’s seventh league victory in a row and a comeback from Arturo Vidal’s first-minute opener secures them the second place in Serie A table. Little do they know that after this success, they’ll win only seven out of 27 remaining matches, fall to the teams like Cagliari, Siena or Palermo, slide down to the ninth place and register the worst league finish in 20 years. Last away victory in Serie A: Juventus 1-3 Inter on November 3, 2012. FOUR MONTHS AGO. Totti’s great revenge happens three years after his Coppa Italia defeat. At San Siro, in front of 62 thousands fans, Roma captain scores a first-half brace and Nerazzurri are down 0-3 at the break. The second-half comeback never happens and Walter Mazzarri’s brilliant start to the season ends. While Erick Thohir’s Indonesian Mahaka Group takes control over the club from Massimo Moratti’s hands, the players produce a mysterious number of draws, splitting the points in 15 out 38 league matches. In the end, that is only enough for the fifth place and Europa League qualification. 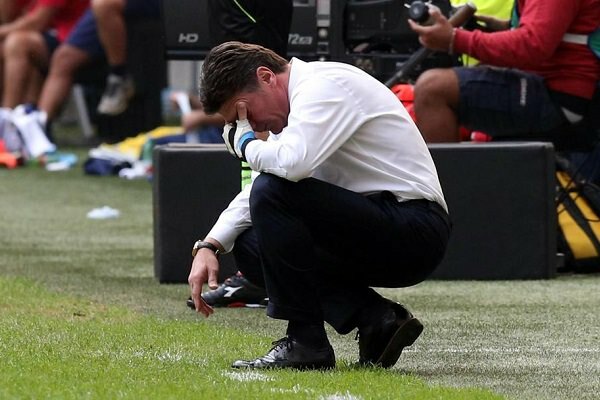 Walter Mazzarri, watching the Cagliari disaster. He picks up a ball pushed out by Samir Handanović and scores from close range. Then, he smashes in Victor Ibarbo’s low cross after the Colombian winger has done all the hard work to set the goal up. Finally, he picks up a bouncing ball from a corner kick scramble and completes a hat-trick. It’s true: Albin Ekdal is the second player in the 21st century to score three goals away at Inter – after Atalanta’s Germán Denis in 2013. Mazzarri is later sacked and Inter finish the year even worse than in 2012 – with just 55 points. A year minus a day from the Cagliari humiliation, Roberto Mancini’s Inter lose 1-4 to Fiorentina, making Nikola Kalinić the third 21st century man to smash a San Siro hat-trick. This time though, the players respond better to the upset. Emphasizing the safety-first approach, they score eleven 1-0 wins and surpass the last-year point tally by twelve. Unfortunately for them, Juventus, Roma and Napoli are destroying everyone in sight so the team’s improvement is rewarded merely with another Europa League spot. Another lemon in Milan. Frank de Boer’s subordinates open their UEL adventure with a 0-2 defeat to Hapoel Be’er Sheva. The first goal is a schoolboy marking error at the far post, allowing an easy tap-in; the second comes from a direct free-kick. This later leads to more humiliation and the side in black and blue crashes out of the group involving their Israeli conquerors, Southampton and Sparta Prague. Just like a year later in Crystal Palace, de Boer is out the door early and chaos ensues. Luciano Spalletti’s lads drop two points in Bologna but this time, nothing terrible happens. For four months, San Siro is full of Scudetto hope as it’s hosts win 12 games and draw four to remain unbeaten until December. Then, a sudden disaster strikes. 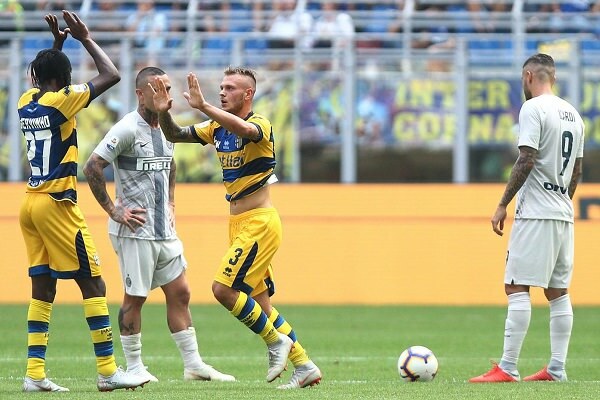 A week after earning a precious one point at Juventus, Nerazzurri fall at home to Udinese, entering a nine-week slump that pushes them outside of the top three. Instead of challenging for the title, they end up narrowly edging out Lazio on a Champions League qualification.